FedScoop is pleased to release the 2018 Top Women in Technology list, honoring the elite, talented, intelligent and successful women influencing and shaping the federal government’s use of modern technology. 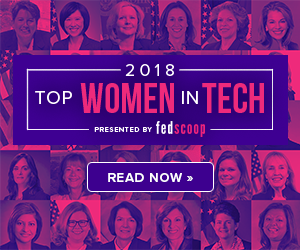 Each year, FedScoop seeks out a diverse list of women from all walks of life, perspectives and backgrounds — from Capitol Hill and the White House to Fortune 500 technology firms — who each have one thing in common: a passion for driving digital transformation to better serve the American citizenry. It’s important to highlight the timing of this year’s list, as the fight for women’s equality in the workplace and movements like #MeToo and Time’s Up have dominated the national conversation in recent months. With this list, FedScoop hopes to empower and honor these 50 ladies who have reached the pinnacle of the often-male-dominated government tech industry, and to inspire others following in their footsteps to persist in spite of adversity. Like years past, FedScoop spoke with each of the women on the list about their backgrounds in the tech space, their perceptions as women working in the tech workforce, what they love about their jobs, and how they’ve achieved all that they have. Please take the time to read through the list, soak up the wisdom these women have offered, congratulate them, and share it with your peers, families and colleagues — whether in-person or on social media. Also, check out StateScoop’s 2018 Top Women in Technology. The following FedScoop staff contributed to this report: Billy Mitchell, Tajha Chappellet-Lanier and Carten Cordell, with special help from Joe Warminsky, Jolie Gendler and Komi Akoumany. Editor’s note: Interviews were edited for clarity and length. CLICK HERE for an abridged, clickable list of all the winners.